������� Understand this about the Wine Patrol: we love wine, but we aren�t geeks. Wine is part of our daily lives. It belongs on our tables just like a loaf of bread or silverware. We judge wine on how it tastes in our glass, not on any 100 point system. We can�t afford $100 bottles of wine, and think it�s a little silly to spend that much when we can be just as happy with a bottle that costs $15. ������� We work for a living, pay for our homes and cars and kid�s educations. We�re not poor, but we�re not rich either. We understand the word �budget�. A fine meal with friends, delicious food and some good wine makes us happy. In fact, food, wine and friends are what the Wine Patrol is all about. ������� The Wine Patrol was started by people who made wine and people who sold wine. Most of us have been in the business for a long time. We made a pact to speak out whenever we encountered a wine crime. Well, we�ve got a wine crime and the time to speak out is now. ������� We love to eat food in restaurants, but what�s fine dining without wine? When we walk into most restaurants and are handed the wine list, we are appalled. It shouldn�t say �Wine List,� it should say �Screw You.� The prices are ridiculous. A full meal in these restaurants with an appetizer, entr�e and desert is less than the average price of a bottle of wine, which now runs between $40 and $50. This is a wine crime, and the Wine Patrol is ready to speak out. ������� Restaurants routinely price their wines at 2� to 3 times what they pay for them. If they buy a bottle for $20, you are likely to see that bottle priced at $50�$60 on their list. With our current distribution network, the winery that produced that same $20 bottle of wine was lucky to get $12 for it. The winery grew or purchased the grapes, produced the wine, barrel aged it and bottled it. They designed the label, and bought the glass, corks and capsules. They stored the wine, shipped it, billed for it and sold it. The wineries make enough profit selling that bottle for $12 to stay in business and grow. The restaurant wants to make $40 for that same bottle just to open it for you and pour it into a glass. That�s a wine crime. ������� Why do restaurants charge so much? Because they can, because everyone else does and because we let them. Well, no more. 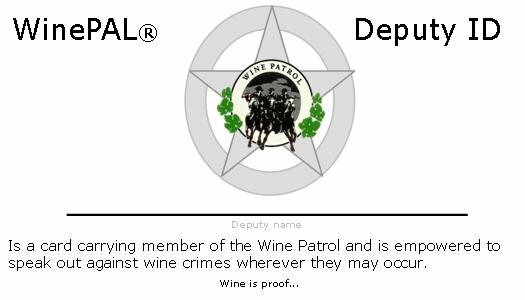 The Wine Patrol is pleased to announce its Wine Patrol Approved List (WinePAL�) program. The Wine Patrol is now recruiting deputies. Deputies will have identification cards depicting the Wine Patrol logo and your status as a deputy. Deputies will also have cards they can leave in the restaurants that direct the wine buyers to the website where they can see the requirements for achieving the WinePAL certification. When dining at a fine restaurant, one with wine prices in the stratosphere, simply leave a card when you pay the bill. �Restaurant owners will scream that they have to charge these outlandish prices. That�s a crock. They don�t charge like that in Europe. The people would never stand for it. We shouldn�t either. If we get enough deputies to leave enough cards, restaurant owners will listen. Please look through the rest of this site. See what we require for WinePAL certification. Check out the press release that goes out to the media on St. Patrick�s Day. Read the Jake Lorenzo column. See what the WinePAL cards look like and read what they say. If all of this speaks to you, then sign up to be a deputy. ��������� The $5 will cover the cost of your identity card, a second identity card for a friend, 18 WinePAL cards to leave at restaurants and the cost of mailing the items to you. Send your check in today, and don�t forget to include a return address. Get with the WinePAL program. We can change the way wine is sold in restaurants.